Most importantly, my two favourite shows The Office and Pushing Daisies are gone. GONE. Withered away like a piece of rubbish. I am going too far. They're dead. Alone. Frozen in mid-action while Grandfather Time takes his vacation. Hope it works itself out perfectly for the writers, and I also hope it means 44 episodes a season (as if!). Good luck writers of America. I feel bad about this, too. I really miss The Daily Show, and Colbert. And I'm sure HOUSE will be affected. thank god for my reality shows! How long will the strike last?? I'm kinda upset about this. My new favorite show is Moonlight and I rarely watch network TV. I was hearing that the new shows are most vulnerable to the strike because the networks only order a few episodes at a time and if they should be forced to stop production, the show may never come back. If Moonlight gets dropped because of this writer's strike I'm gonna be so pissed. Why are they striking? I haven't kept up with it. Money is the reason. The writers want to get paid royalties for the DVD's and shows they play on the internet. IN AN essay, “The Catastrophe of Success”, Tennessee Williams wrote that “security is a kind of death, I think, and it can come to you...anywhere at all that is removed from the conditions that made you an artist.” That may offer comfort to the thousands of writers in Los Angeles and New York who went on strike this week, risking their incomes and careers. They want more money for their work when it is used online than Hollywood studios are willing to pay. Because the strike is over matters of principle, not just dollars and cents, it could last for months. Media companies argue that the market has become increasingly competitive and uncertain for many reasons, including internet piracy and tumbling box-office receipts. They want to cut writers' income from “residuals”, which are payments made when a TV show is re-used. The writers are determined not to repeat the mistake they made in 1985, when they listened to the studios' plea that home video was an unproven new market and agreed to a residual payment of 0.3%, which translates into about four cents for each sale of a DVD—or one-tenth of what DVD-box manufacturers get. The writers now want a residual payment of 2.5% for re-use of material online and on mobile phones. The studios say that internet delivery is the same as home video, so the old rate still applies. And they refuse to pay anything to writers when content is streamed over the internet free to viewers, supported by ads, because this is merely “promotion”. Both sides made last-minute concessions on traditional-media payments. But because new-media rights are so critical to the future earnings of writers and studios, neither was willing to compromise. Who will suffer the most? “The strike won't affect most studios unless the writers stay out three to five months,” says a senior executive at a media conglomerate. Because writers on reality and animation programmes are not unionised, the networks will be able to switch to other forms of programming; sport will fill the gaps, too. But Moody's, a credit-rating agency, reckons that a strike lasting into late 2008 would have a serious financial impact. Broadcast networks and premium-cable channels would be hurt most, because they rely most on first-run scripted shows. Some writers, of course, are wealthy. “I'm walking the picket line with some guys who are worth millions,” says Lou DiMaggio, a reality- and game-show writer who won an Emmy award for “Win Ben Stein's Money”. But the vast majority of writers, he says, earn about $50,000-75,000 a year. Mr DiMaggio says he backed out of buying a house because of the strike; junior writers may have to go back to waiting tables. Luckily for Hollywood, however, most scribes are too devoted to their calling to be put off. Gary Goldman, a writer picketing outside Fox Studios who has worked on science-fiction thrillers such as “Minority Report”, says that many writers will spend their free time working on screenplays that they hope to sell to the studios on spec. “I think we're allowed to do that,” he says. As much as I hate repeats I'm behind the writers. Go for it! Actors still get paid for repeats, producers still get paid, execs still get paid, why shouldn't writers considering it's their work the rest of them are using to get paid. Well, at least all Dexter episodes will air, but the rest of it is a disaster. I'm especially worried about some new shows like Chuck, Reaper and Journeyman-hope this won't be their kiss of death. 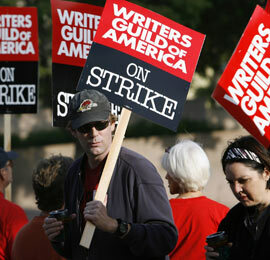 “The strike won't affect most studios unless the writers stay out three to five months,” says a senior executive at a media conglomerate. I think this is an overly optimistic view of things, and I don't think it's any coincidence that it was said by a media executive. I think the studios will start panicking as soon as advertisers yank their money away from them. And if I were an advertiser, I sure as hell wouldn't wait 3-5 months to pull spots if hardly anyone is watching. Didn't they strike something like 22 weeks in 1988? Did I dream that? Let it all collapse and turn into rubble. Execs are not going to divide the pie much further. Yeah they did and I read it had a devastating effect on the industry and the writers. I think they deadlocked, and nothing ever came of that one either. But still, I think even if they know that they might not win this, most of them are doing this on principle. At some point you have to stand up for yourself and let the powers that be know that they can't just walk all over you with no consequence. With the writers’ strike in week two now, TV viewers are getting antsy, wondering how many more new episodes of their favorite shows they can expect before the re-runs begin. While all of the shows have different schedules, Michael Ausiello at TV Guide was kind enough to provide an extensive listing of the remaining episodes. The first casualty? “The Office.” Sadly, there’s only one new episode left and it airs this week. Beyonce causes Ethiopia hunger strike? Paris Hilton now on Hunger Strike? PETArds strike again: save the cockroaches!